Hannah and James were married about 1884, and had three children: Albert Charles born June 2nd of 1885, Anna Mae born December 14, 1891, and Lillian, born in January of 1895. James Kiester left the family shortly after Lillian's birth, and I know little of him except that he is said to have worked in the Fehrmann Brewery, though I've not found evidence of such a brewery. Hannah took in washing and sewed to support her children. "I will and bequeth to my three youngest children Mary Fehrmann, William Fehrmann and Charles Fehrmann the sum of three hundred dollars each." 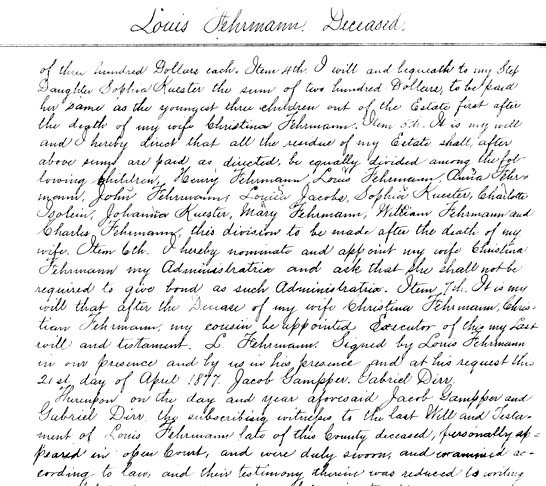 "I will and bequeth to my Step Daughter Sophia Kuester the sum of two hundred dollars..."
"... be equally divided among the following children, Henry Fehrmann, Louis Fehrmann, Anna Fehrmann, John Fehrmann, Louisa Jacobs, Sophia Kuester, Charlotte Isolein, Johanna Kuester, Mary Fehrmann, William Fehrmann, and Charles Fehrmann." "After the decease of my wife Christina Fehrmann, Christian Fehrmann my cousin be appointed Executor of this my last will and testament." Signed 21st day of April, 1877. Mary, William, and Charles were the children of Louis and Christina Reuter, the second marriage for both. Henry, Louis, Anna, and John were the children of Louis and his first wife Caroline Gerding. Louisa, Sophia, Charlotte, and Johanna [our Hannah] were the children of Karl Kuster and Christina Reuter. Louisa married Max Jacobs in 1872, and Charlotte married Joseph Eiselein in 1870. Hannah Kiester is listed in the 1884 Cincinnati City Directory as living at Joseph Eiselein's; in 1888 and 1889 she's listed as being at Marcus Jakobs. In 1890, she's living on Dodsworth Avenue, and is a seamstress. By 1897, she appears as Mrs Hannah Kiester, suggesting she was now widowed. Hannah is buried at Vine Street Cemetery next to her mother, passing away on 27 April, 1940 in Norwood.